When working in a pizzeria, you rely on the pizza peels to move the pizzas into the oven, and a turning pizza peel allows you to rotate the pizza during the time it cooks. This leaves the larger peels available for other tasks. The smaller heads on these peels are perforated stainless steel, sturdy enough to turn pizzas loaded with toppings, and easy to keep clean. GI Metal calls this a small round peel. Others have called it a banjo peel. To us, it is simply a turning peel because this small peel is used primarily for turning the pizza in your wood-fired pizza oven. 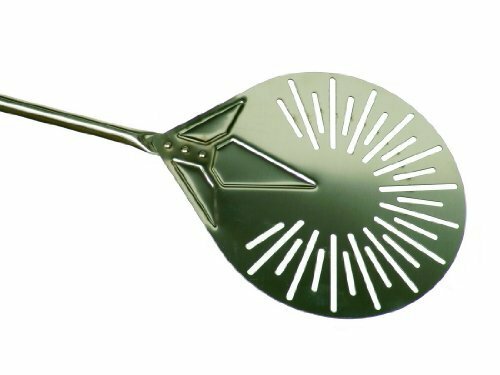 This pizza tool is perforated with a sunburst pattern that makes the peel lighter, which may help allow loose items (like, ash, cornmeal, crumbs, etc) under your pizza to fall through the perforations while you turn and relocate the pizza in the oven. Handle includes Blue Sliding Element: sliding element and handle edge made with high-density polymer that will protect user from heat of the oven Stainless Steel: Stainless Steel head with low Nickel content 08/10 mm thick. You can also use it to remove your breads, crispy sandwiches, or other baked items from the conventional or wood-burning oven. The turning peel head is made of stainless steel and the stainless steel handle with a smooth sliding heat resistant plastic handle. Made in Italy for professionals.